Provide tourists, tourism industry and citizens with convenient, quick and efficient quality services, and committed to build Macao as a Quality Tourist Destination. - Improve tourism management and promote healthy development of tourism industry. 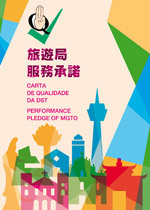 Synchronize the team with harmonious spirit, facilitate the diversions of tourism industry and shape Macao into a World Centre of Tourism and Leisure. - Issue license to firms that pertain to the field of tourism industry. 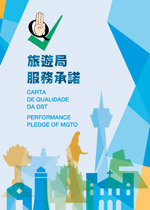 The Performance Pledge working group of MGTO is responsible for supervising the Services and examining the Service Level on a regular basis. Tourists, tourism industry and citizens are welcome to give their opinions on the services offered by MGTO and to lodge complaints against any unsatisfactory services.